Today I’ve got three white wines. Yes, despite the fact that I am a red wine whore fan, at times the food, the day, the palate cry out for a white wine. I’m not entirely sure when, but my husband makes sure to point out all the signs. Like, he opens a bottle of white wine and pours it for dinner. That’s usually a really good sign that it’s time for a white wine. So, without further ado, here are the three that have managed to sneak onto my dinner table in the past couple of weeks. “Zesty and floral, our Pinot Grigio has delicate notes of honeysuckle and figs which finish with a crisp, soft note. Enjoy its refreshing finish with wood-fired quatro pizza or simply as an aperitif. My Take: In my opinion, people in the wine industry should not try to become standup comics. Neither should they try to be “cute” with their labels. 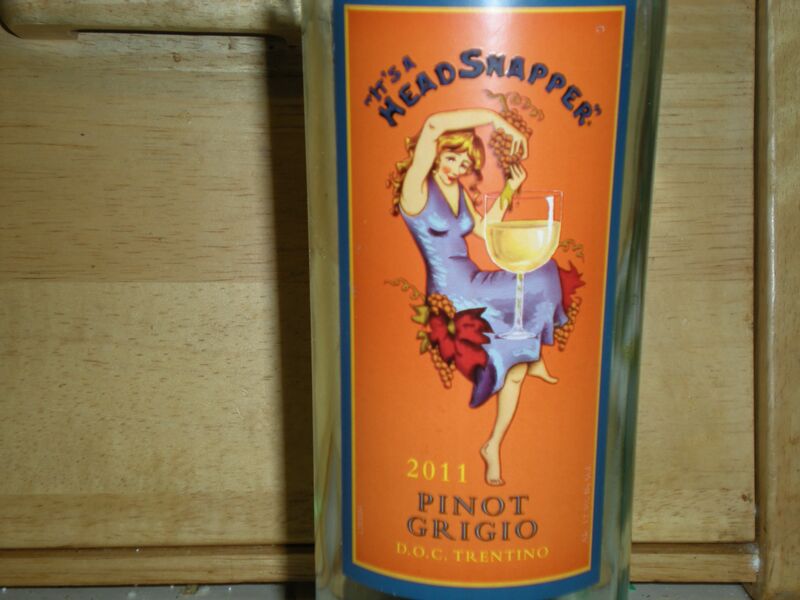 Honestly, it took me several years after seeing my first “HeadSnapper” label to actually get up the nerve to buy one. On the one hand, the subliminal message of the label could be, “hey, we don’t take ourselves too seriously and neither should you” – but it could also be saying “we’re a really bad wine disguising ourselves with a funny label”. I finally got up the nerve, in spite of the label, to give it a whirl. I liked it. Crisp, refreshing, just the way a Pinot Grigio should taste. I didn’t taste any figs or honeysuckle, but it was a nice, clean wine that was in no way offensive. My Rating: ~ Drinkable Plus ~ Yeah, technically that’s not a rating, but it didn’t quite elevate itself up to Very Drinkable so I had to come up with something else. Drinkable Plus seems to work for now. Toad Hollow 2010 Unoaked Chardonnay Francine’s Selection, Mendocino County Alcohol 13.9% by Volume, under $10 at Vons. On the Label: “2010 Unoaked Chardonnay. Clean, crisp and full flavored with hints of mango and melon and a rich, creamy mouth feel. Pair with herbed chicken, braised pork, grilled shellfish, sushi. Also great with goat cheese and gouda. A treat for the senses! My Take: Okay, okay, no oak. I get it. Though why they would brag about leaving out an important (to me) part of wooing the chardonnay grapes is totally beside me. Though I do understand there are fanatic Chardonnay drinkers out there who actually prefer the stainless steel taste in their Chardonnay and in fact, am friends with more than a few, I do believe this is just a fad and will fade with time. My fondest hope is that there will be a middle ground – not the huge buttery, oaky Chardonnays of the 1980s (which was a fad in itself), but something milder, and without the metallic taste so often prevalent in the unoaked Chardonnays. My Rating: ~ Thiscloseto Very Drinkable ~ Yes. Despite my rant above, this is close to being a Very Drinkable wine. Not too metallic (but that does creep in a tiny bit to my personal palate) but drinkable. Despite the cutesy label (with Mr. Toad, in waistcoat and walking stick, lifting a glass to the sky), too – I guess after the HeadSnapper label, this one was mild in comparison. At any rate, all you Unoaked fans will appreciate this one. My Take: There is so much wrong with that back label that I’m stumped as to where to start. I’m not sure, for instance, that I want to know what part of Dennis’ sense of personal renewal shows in the wine. Is it the sweat of work well done? *shudder* And how about where he “invites” his friend, Chardonnay, to relax with him – and then CONSUMES said friend? It’s just – disturbing. But for me, the icing on the cake is their trumpeting of their “green” practices. If you have to shout about it on the label…*shakes head*. I suppose it is a good thing that I make a practice of NEVER reading the back label before I buy. 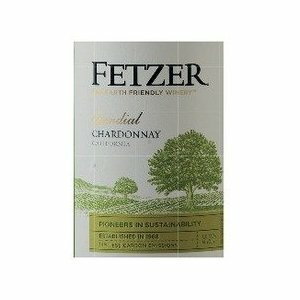 My Rating: ~ Very Drinkable ~ When all is said and done, Fetzer Sundial Chardonnay has been a favorite of mine for over 20 years. They’ve kept the price low, which means I can still afford it, and it’s a solid producer, year after year. What’s not to like? As usual, this is just my honest opinion and depend upon my mood, the weather, and what cycle the moon is in. Your taste buds will differ. Thanks for dropping by! I love your comments – what new wine (or old favorite) have you enjoyed recently? This entry was posted in Wine Friday and tagged chardonnay, Christine Ashworth, Fetzer, HeadSnapper, Italy, Mendocino County, Pinot Grigio, Sundial Chardonnay, Toad Hollow, unoaked, Wine Friday. Bookmark the permalink. I love your wine posts. I’ve been tip-toeing into wine drinking for about 18 years now 🙂 My favorite Fetzer’s Gewurstraminer. It may be due more to fondness than quality. It was the very first wine that I ever drank. Mostly, I drink Riesling because it’s closest that most restaurants have on the menu. Wendy, I got into wines when I paired them with food. Find a fun food to learn how to make, and buy a good wine to go with. It’s an interesting way to learn! “…invites his friend, Chardonnay, and then consumes said friend.” LOL! Thanks for the morning smile! I want to try It’s A HeadSnapper just for the adorable label. Emma, they have all different varietals – give your favorite a shot, and let me know if you like it! I’m with you on the unoaked thing. Give me the oak! When it comes to Chards, if they’re not big and buttery, then just pour me a Cab! Ah Sam, a girl after my own heart! I’ve decided not to read labels at all but to follow your guidance. I have a notepage in my iPhone with “christine’s recommendations” as the title. Seriously. *snort* Brinda, you crack me up. Oh, wait. Seriously? Hey – that’s kinda keen! Let me know if our palates are similar, or if you want me to taste something for you. I don’t actually follow your advice but I love, love, love your wine posts. You know if I had a note page in the phone I might, but that would then require me figuring out how to do that which probably won’t be happening this year (or possibly this decade). At any rate, it is totally hard to imagine a Chardonnay, especially one without any time in an oak barrel, pairing well with goat cheese. I love goat cheese, too, and I guess that I may need to go out and buy one, but I want one with oak, and try it with some goat cheese. Hmmm. OH! Last night I was at this lovely, little pretentious wine and spirits store in downtown Pasadena. I was waiting for a showing of Bonzai People to begin at the Armory. I went in thinking, “Well, there won’t even be anything here that Christine would be able to post about.” And some of the bottles did not disappoint, “WTFork? $219.52 (or some such bizarre amount) for a bottle of wine? There better be a happy ending in that bottle.” Except — there were bottles for $20 and under. I even found a couple at the $10 mark. Some day when you are out this way, you will need to try this store Everson Royce Wine Store at 155 N Raymond Ave. I think you might enjoy the place very much. Maria, I’d LOVE to plan a girls’ day in Pasadena! And I do love wine shops – I love to poke around bottles that cost more than my wedding dress did in 1980. I’d love to go to the Armory, too – never been there. We should plan! Cheers hon! And thanks for loving my posts – that makes me a happy girl! After living in the wine country of western Oregon before I was of age, I’ve wanted to go take a tasting class at a winery for ages, but have never done it. Having said that, I enjoy wine, but know I actually know nothing about it, so I always avoid making recommendations in case of mockery! That last wine on your list sounds good, though. I need to scan through and find a Hands Off wine. Shannon, I am by no means an expert. I like what I like, and there’s no rhyme nor reason to it – other than my pocketbook constraints. So recommend away! As long as you LIKE the wine you’re recommending, and the other person likes the TYPE of wine, then you’re fine. Don’t be shy!